1) YOUTH, SUMMER, TRAVEL: IT WAS ACES! 2) STAFF CELEBRATE "WE ARE EIGHT"
6) IT'S TRUE WHAT YOU HEAR: NEW GEAR! YOUTH, SUMMER, TRAVEL: IT WAS ACES! 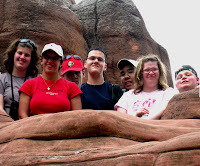 Active Community Experiences in Summer (ACES) offers teens and young adults with intellectual disabilities who are still in school the opportunity to plan and exp erience a trip! This year two different small groups headed to Toronto for three nights. Each group had the opportunity to make collective decisions about what they would do with their time in Canada's largest city. The student residence accommodations at the Victoria University campus of the University of Toronto offered an interesting environment for mingling with other travelers, including a Scottish rugby team! Each of the two LiveWorkPlay youth groups chose a slightly different itinerary, but both chose to travel by train. Each person was responsible for managing their own identification, money, and transit pass (sometimes they ro de the subway more than 10 times in a single day!). 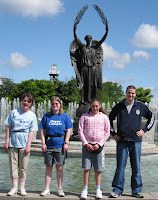 There were visits to the CN Tower, a Blue Jays game, the Sound of Music, Medieval Times, Canada's Wonderland, the Royal Ontario Museum, the Hockey Hall of Fame, the Toronto Zoo, and more! It was a real "get in shape" trip with tons of walking with hops on and off not only the subway but also streetcars, TTC buses, and the GO bus. You can get a flavour for the two trips from the photo albums. Just click on the pictures above. If you have a Facebook account you can see hundreds more photos plus weekly video journals from the LiveWorkPlay fan page! STAFF CELEBRATE "WE ARE EIGHT"
The LiveWorkPlay staff recently got together to celebrate for the first time the new team of eight. Fran Childs is the newest member, but not the newest face having worked and volunteered with LiveWorkPlay for many years. Fran spent four years teaching in a Gatineau school board and in July assumed her new duties as Coordinator of Volunteers and Support Networks. Anthony Stratton is the newest face, having just completed his first three months on the job providing supports for independent living, but he too is already familiar to many, having completed a lengthy placement with LiveWorkPlay while completing the Social Service Worker program at Loyalist College. The recent "big news" within the team was the wedding of Allison Moores (Manager of Mental Health Supports) to Jeffrey Manthorpe - you might also know him as "Professor Jeff" from his science experiments on Family Fun Nights. 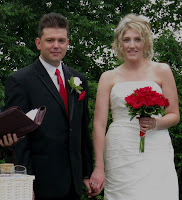 The happy couple are pictured above right. You can learn more about all of the team from the LiveWorkPlay website in the staff section. The annual Orientation and Annual General Meeting has been moved up to August 27. The Orientation begins at 6:30 and the AGM will start at 8:00. The Orientation is a "must attend" event for those individuals and their family members involved with any and all youth services (Journeys and ACES) and any and all adult services (SMILE). Constance Hudak, David Keay, and Peter Keay have kindly opened up the use of their lovely family cottage to many adult members at LiveWorkPlay. 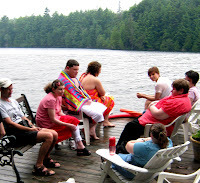 In addition to swimming in a pristine lake, there have been boat rides, games, and of course delicious barbecue meals. On the first of two visits so far this summer, a big group hanging out on the dock was treated to a visit by a snapping turtle that swam right up and said hello! It's been an exciting year with many adults associated with LiveWorkPlay moving out to homes of their own for the first time. This includes a small group of individuals that are living in the same condominium building. Some own their own units, and ot hers rent from LiveWorkPlay, which acquired units with support from Action Ottawa, the local version of the Canada-Ontario Affordable Housing Program. 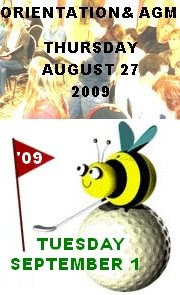 The building's community room was the location for a July celebration that brought everyone together for the first time. 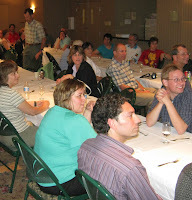 About 60 family members and neighbours joined in for a delicious catered meal from the Newport Restaurant. It was also an opportunity to right a wrong from the Engines of Success banquet in June, when Peter Keay was overlooked as a qualified recipient for the TOMORA presentations. A very surprised Peter accepted his award at the condo living celebration to thunderous applause! We hope you have enjoyed this 32nd edition of LiveWorkPlayNews. If you have received an email about this blog in error and/or you would prefer not to receive future LiveWorkPlayNews messages, simply click here and follow the simple instructions. Click here for the web page that can be used by newcomers who would like to join LiveWorkPlayNews. Feel free to share the address with friends, colleagues, and family who might like to subscribe. Send story ideas to Keenan Wellar.